Final Score: 8.0 – Worth watching at festivals and art house theaters! When artistic hipster Sean (Josh Tyson) decides to make a film, he invites his old high school flame, Emily (Samantha Soule), to help him write it. 15 years out of high school, Emily is now a successful partner in a law firm and the only person Sean—whose never stuck it out at any of his creative ventures—knows with the actual cash to bankroll his project. Meeting at a summer house on the beach that Emily’s side-action owns, they agree to a weekend writer’s retreat that explores not only what they want to do next, but also the things they never resolved from their relationship in the past. While the creators have officially put this film in the genre of drama and comedy, we opted to remove comedy from its description because the story of this film is a pure drama that happens to have some levity. It never gets to the dreaded Dramedy genre, but it’s also not so morose that you feel the writers’ were just playing drinking games with depressing themes (unlike a recent Oscar nominee starring Casey Affleck). The story is less about telling a larger narrative and more about setting up a situation that drives the characters to get honest with each other through a gauntlet of booze, reminiscing, lust, manipulation, and secrets. The acting from the two main leads was strong enough to stand up to a story that was driven solely by what those two characters could bring to the table. From this perspective, I felt the entire film worked pretty well and held up throughout to a solid ending. This is a well directed debut feature film by Nicholas Zafonte, based off a screenplay by himself and co-writer J.D. Singer, and was well lensed by cinematographer Jon Beanlands with RED cameras. The film chose to pursue SAG/AFTRA certification, which permitted them to get actors with a certain type of experience and training. That choice can quickly get very expensive due to well-known SAG Indie issues with microbudget films—but, by using just two actors in the entire film (as the setting was remote and required no additional characters), the producers were able to keep things affordable and give newer SAG actors much more screen time to showcase their skills (which they did really well). That’s extremely savvy producing and mutually beneficial structuring for all involved. But things start to blur into unresolved issues from their past. And that only by working through them can they create a friendship for the future. As the character Emily, Samantha Soule’s style and performance reminded me a lot of Dexter’s Jennifer Carpenter. While the film did drag a bit in the middle, it stayed compelling enough to keep me engaged even at a midnight screening when I was already a bit exhausted. Character pieces (especially with only two actors in the entire film) are really hard to do without feeling overwrought or like aimless en trenches de vie (slices of life). 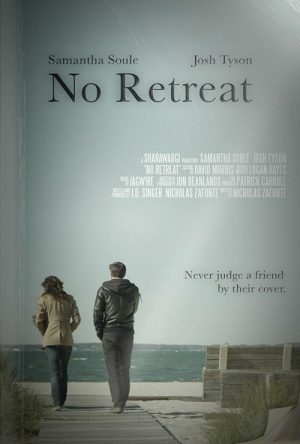 No Retreat manages to feel grounded and realistic, while also having a conclusion that’s got some resolution to it. 8.0 – Worth watching at festivals and art house theaters! Thanks for the really thought out, insightful review!